This Friday, March 9th at 8PM at A Comic Shop will be the darkest, most terrible Anime Nite @ The Geek Easy we've ever hosted! NOBODY Survives the Anime Apocalypse! The event is free and we'll have some beer to share with those over 21. You can bring some too so it lasts longer! You must also have your I.D. because we will not be letting minors in. This will be a night of morally bankrupt anime centered around the fall of society. The earth is in ruin; there are no heroes and their is no hope. What we are showing is explicit in content and not for the feint of heart. You have all been warned! If the content does not bother you, then we hope to see you this Friday! 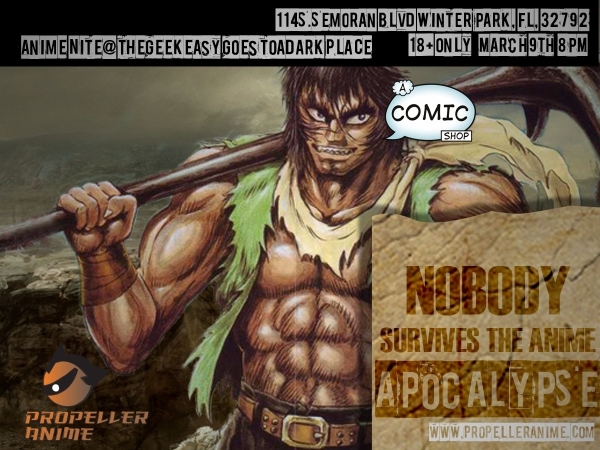 A Comic Shop is at 114 S. Semoran Blvd Winter Park, FL 32792. RSVP on Facebook.